I cant wait to see this in action! 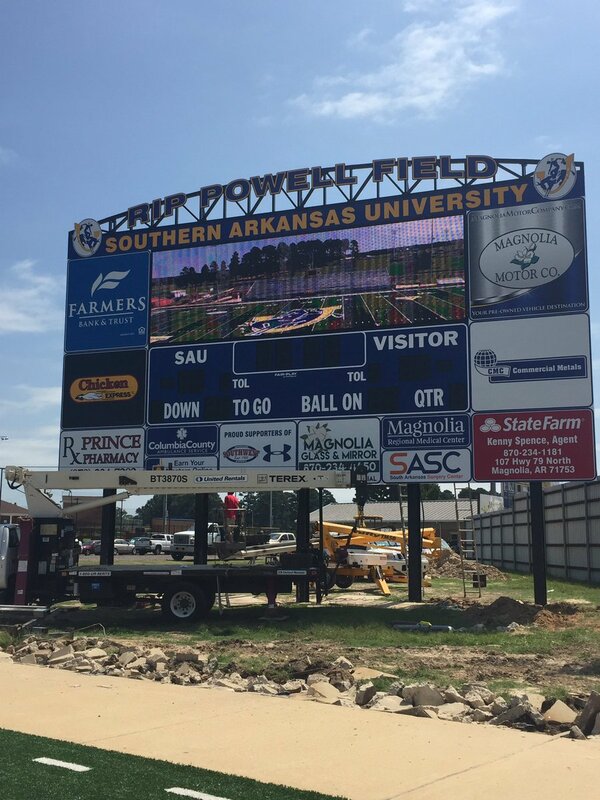 SAUs new scoreboard (in celebration of 100 years of football) will be able to play replays as well as live action! It will be amazing! Last edited by bandguy11; 08-24-2017 at 06:36 PM. Wow, that looks great. Great addition to that stadium. Can't wait to be the first team to light that thing up. Sorry divisiontwo, the visitor side seems to have a limit of 10 to their score! ;) But seriously, I hope we can finally get that horse off our back, or in this case, bison! lol From what I've seen the Rider's look pretty strong on both sides of the field, but of course I cant look at the first 2 games on our schedule and breathe a sigh of relief!! A very good ATU team, and historically for us an unbeatable Harding team! After that I see a good run, after maybe, hopefully not, a 0-2 start!! Looking past the Reddie's? LOL!. As you know a champion team (and SAU should be the GAC champs this year) will require discipline to stay focused. Too many teams could upset the year for SAU and I would not look past any team, much less a school in Arkadelphia which has won 5 of the 6 GAC championships. The QB's seem to make a difference to me in D2 and Renner looks like the guy to take it to the house and bring home the championship. But that's why we get to play the game, so we can see who is the best. I will be in Russellville and Arkadelphia for the games with SAU. Harding will have to prove to me they can lose many seniors and still keep the pace of beating the top teams. They will be good, but not the GAC champions for 2017. And we will wait for Divisiontwo to give his 2 cents. 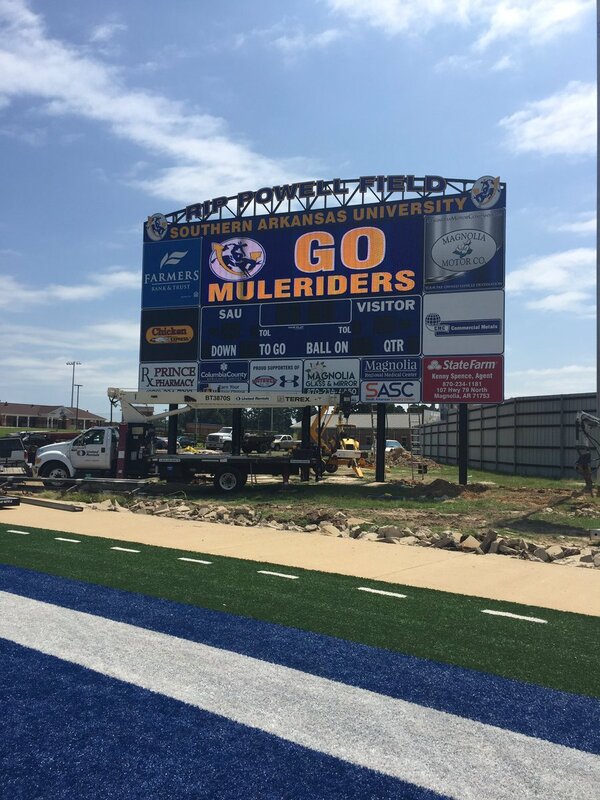 The Scoreboard looks great. I have always liked the SAU stadium. ONE WEEK FROM TODAY!!!!!!!!!!!!!!!!! Go Reddies!!!!!!!! Looking past the Reddie's? LOL!. As you know a champion team (and SAU should be the GAC champs this year) will require discipline to stay focused. Too many teams could upset the year for SAU and I would not look past any team, much less a school in Arkadelphia which has won 5 of the 6 GAC championships. ! Not particularly overlooking either arkadelphia team, especially after the realOBU derailed our playoff contention last year!! Anyways, the 1st game will probably set the tone for HU, HSU, and SAU!! Who takes a loss, who bounces back??!! If I'm a betting man ( Typically not) I would think SAU and HSU will win. Both ATU and Harding don't want to lose at home, especially HU . Where are the OBU and SWOSU posters this year? I personally think the trophy will go to the winner of the game Thursday night. HU has some pretty sizable holes to fill in that front 6 on defense. Going to need some young guys to get good really quick. Secondary will be just fine. HU will probably be as fast on offense as they've been since they started running the triple and very good up front. Might have to win some shootouts. It's probably going to be played in wet conditions. The passing game will probably be restricted. I hope the game plan for the Reddies will be ready for the wet conditions.